Bees pollinate more than 130 fruit, vegetable, and seed crops that we rely on to survive. Bees are also crucial to the reproduction and diversity of flowering plants, and the economic contributions of these irreplaceable insects measure in the tens of billions of dollars each year. Yet bees are dying at an alarming rate, threatening food supplies and ecosystems around the world. 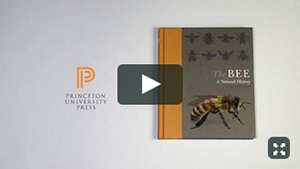 In this richly illustrated natural history of the bee, which includes more than 250 color photographs and illustrations, Noah Wilson-Rich and his team of bee experts provide a window into the vitally important role that bees play in the life of our planet. Earth is home to more than 20,000 bee species, from fluorescent-colored orchid bees and sweat bees to flower-nesting squash bees and leaf-cutter bees. This book provides an unmatched account of this astounding diversity, blending an engaging narrative with practical, hands-on discussions of such topics as beekeeping and bee health. It explores our relationship with the bee over evolutionary time, examining how it originated and where it stands today—and what the future holds for humanity and bees alike. Noah Wilson-Rich is founder and chief scientific officer of The Best Bees Company, a Boston-based beekeeping service and research organization. Kelly Allin was lab manager at the Best Bees Company’s Urban Beekeeping Laboratory and Bee Sanctuary during the writing of this book. Norman Carreck is scientific director of the International Bee Research Association. Andrea Quigley is a freelance writer who contributes regularly to beekeeping journals.